Graham Hughes, a travel writer based in northeast England, began stockpiling last summer as it became increasingly clear that politicians seemed no closer to finding a solution to the Brexit problems. Graham Hughes shows ABC News some of the provisions he has been saving. Graham is a Guinness World Record holder for visiting every country in the world without using a plane. He has a degree in politics and is not a naturally cautious person, he said. 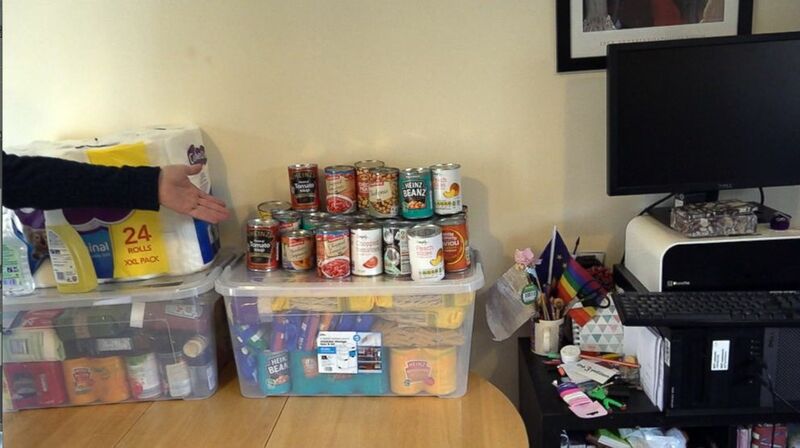 But Graham has now amassed at least a few months supply of canned foods, hygienic products and ordinary medicines. 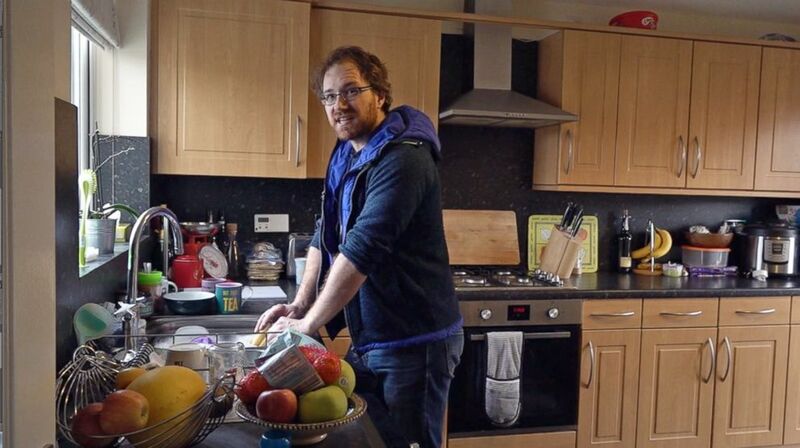 As news reports regularly come out warning of the impact of a no-deal Brexit, he felt it was necessary to begin stockpiling extra food with his partner and her two children. 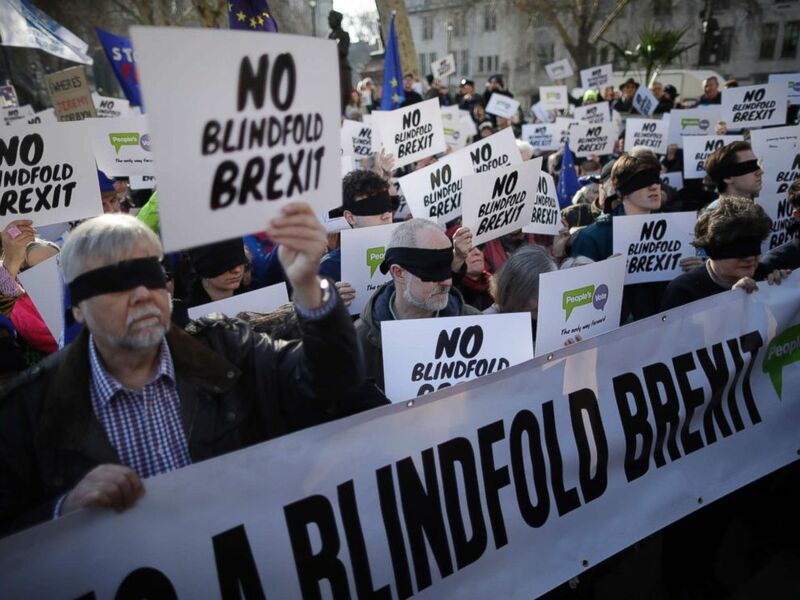 Anti-Brexit activists wear blindfolds as they take part in a protest event organised by the People's Vote Campaign, which calls for a second referendum on Britain's EU membership, in Parliament Square, London, Feb. 14, 2019. The BBC reported last month that pharmacists are struggling to obtain many common medicines. Farming leaders told the government a “no-deal” would be “catastrophic” for U.K. food supplies, according to The Guardian. The Times also reported that officials are considering plans to declare a state of emergency and introduce martial law in the event of “no-deal" last month. Graham Hughes has been stockpiling food since last summer in preparation for a "no-Deal" Brexit. Graham is not alone in having these concerns. Others gather online in a small but growing Facebook group named 48% Peppers. Its membership has doubled in size over the past 30 days to 10,000 people, as the Brexit deadline looms ever closer. The "48%" refers to the percentage of the British population that voted to remain in the European Union in 2016. While Graham said that he has “never wanted to be so wrong” in his life, he is above all acting out of concern for his family.